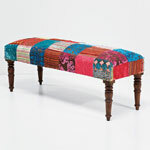 Our wooden benches and stools add an original feel to your design anywhere in the house. Traditionally, they have been used as very useful spare seats. But you can also reach high with our collection of stools and bar stools in Industrial, Classic, Exotic etc. styles. Our stylists have also created practical and attractive benches to tidy everything away in the hall, dining room or living room.